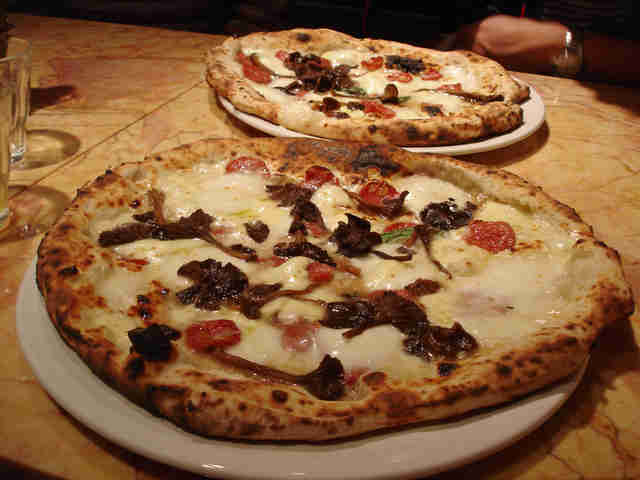 Did you know that London has more pizza places than any European city? Sure, we just made that up, but it could be true, and that basically makes it a fact. And knowing which one of the myriad slice spots near your home/work is the best can be tricky... until now. 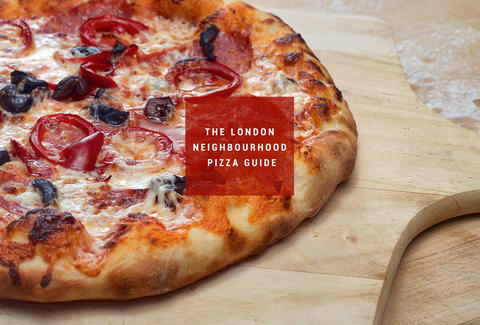 Here are the best pizza places in 13 London neighbourhoods. 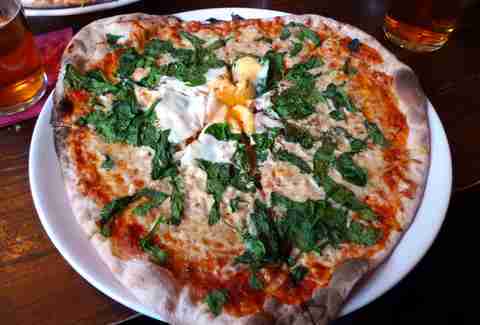 Courtesy of Mayfair Pizza Co.
Hidden in a serpentine alleyway somewhere behind Bond St sits the Mayfair Pizza Co. Despite the grand location, this modern bistro is most proud of its down-to-earth pizzas and its ruggedly good ingredients. Sure, you can opt for a strawberry and basil dessert or the world’s "Hottest Pizza" challenge, but what keeps the yuppies and Euros baying at the door are the old favourites: the wonderfully poised Quattro Formaggi and the sprightly Diavola. Looking eerily like the kind of unwieldy go-kart you might unlock after hundreds of hours misspent playing Mario Kart, Homeslice began life as a domed pizza oven on wheels with a simple mission: to fire pizza by the slice down the throats of hungry hipsters. Then its owners got their hands on some serious real estate in a corner of the hallowed Neal’s Yard, and the game started in earnest. 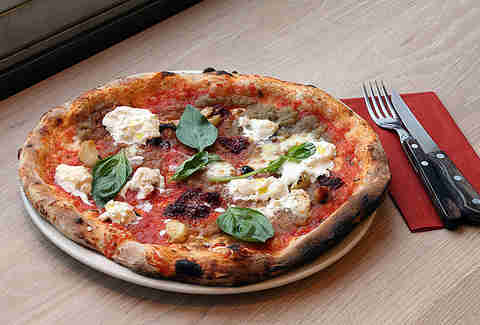 The pick of the bunch is a celeriac, wild garlic, cow’s curd and hazelnuts number, and the pizzas themselves are HUGE. Though the broad green and white stripes of Pizza Pilgrim’s shop front might call to mind those of a patio awning somewhere in Surrey, the food inside couldn’t be more authentically Italian if it held a post-election-fixing party with 17 questionably aged girls. After quitting their day jobs, brothers Thom and James Elliott embarked on a gastronomic tour of Italy, gaining a wealth of local knowledge and several stone in the process. The resulting pizzas are things of simple beauty, with the favourite being the Nduja: an exquisite margherita topped with dollops of coarse and spicy Calabrian sausage. 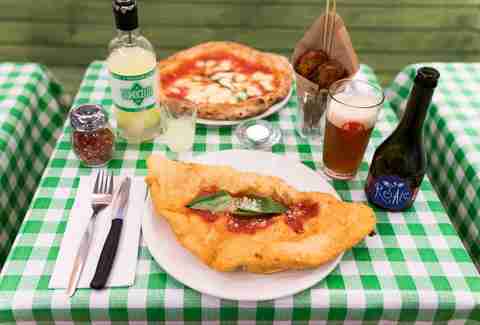 The calzone isn’t necessarily the most aesthetically pleasing member of the pizza family, looking at best like a giant Cornish pasty and at worst like a dropped burrito. 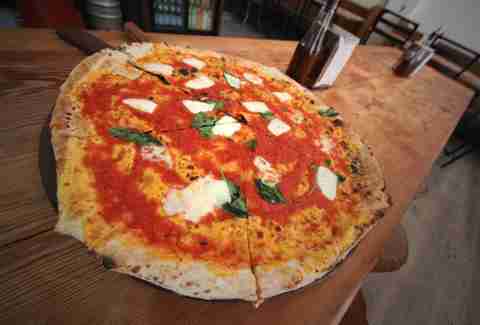 But at Notting Hill’s Saporitalia, that doesn’t really matter. 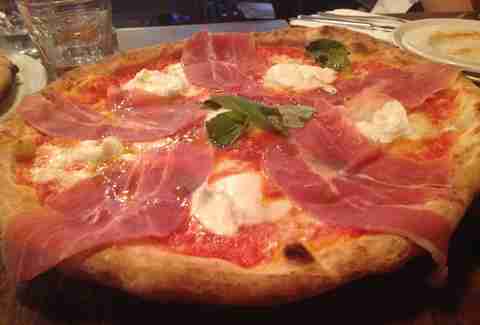 The locals love the gooey decadence of this little bistro’s signature pizza, packed with milky mozzarella, oven-roasted ham, and a splash of marinara sauce. The Portobello Rd has always had a Romanesque feel, with its winding markets and its Italianate name; add in Saporitalia and a glass of Chianti and you may as well be straddling a Vespa on the shores of Lake Como. The folks at Rossopomodoro like to say that their West London joint resides on "Chelsea Beach," the strip of bars and restaurants that runs along the monied Fulham Rd. And despite the fact that literally no one has ever, ever referred to this area as "Chelsea Beach," the relaxed and airy décor of this traditional pizzeria certainly conjures up a holiday vibe. 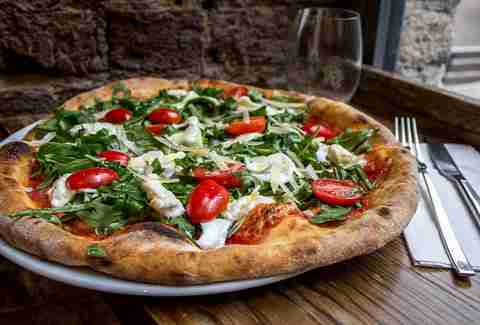 Adhering firmly to the secretive codes of Neapolitan pizza making, Rossopomodoro imports its flour from the Old Country, bakes its bruschetta in-house, and raises its thin and stretchy dough under a wood-fired oven. Unless you find yourself in the control room of a Mediterranean cruise ship, the general rule runs thusly: the more Italians you see, the better. And Santoré is pretty much an unofficial Italian embassy, packed to the rafters with expats desperate for a slice of their homeland. An all-day haven on the fringes of The City, Santoré is utterly laid back and achingly authentic. Choose from old favourites like the bustling Capricciosa or the sultry Napoletana, and find yourself teleported to the Umbrian hills. Pizza East’s Shoreditch mothership might have spawned imitators and sequels across the capital, but the original is still the best. Inside the vaunted tea warehouse, you’ll find canteen-style dining, raucous conversation, and improbably good-looking staff. But even they pale in comparison to the majesty of Pizza East’s LA-style pies: thicker than you’d expect, lightly pudgy, and flecked with smoke. 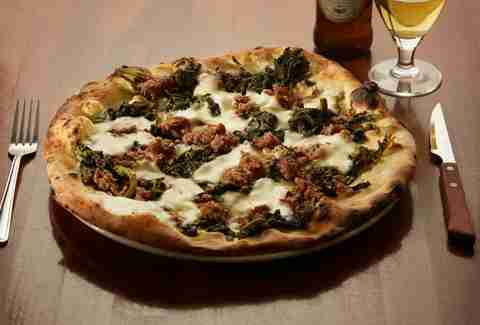 The wunderkind here is topped with veal meatballs, crispy prosciutto, and cream. Sweet, yet serious, it will have you weeping into your second chin. 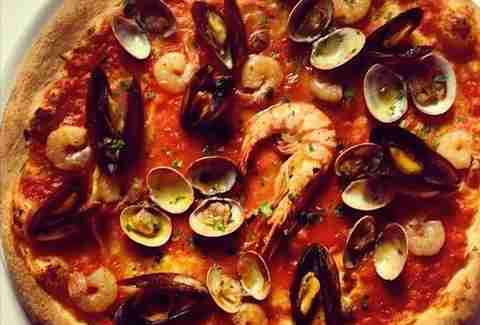 Smart dining and pizza don’t usually live in the same sentence, but somehow Del Mercato makes it work. A slightly upmarket trattoria tucked away behind the sprawl of Borough Market, Del Mercato pumps out solid Italian favourites with flair and finesse. Clapham is said to have the largest population of under-30s of any area in Europe. When these bright young things need to summon up the energy for a night of vodka soda limes and comparing photos of their Mini Coopers, there’s only one place to go: Eco. Since its founding in the early '90s, Eco has become a local institution, and its longevity is no doubt because of the brilliance of the pizzas themselves. A case in point is the mushroom, truffle oil, and pecorino number: a pungent offering atop authentic hand-stretched dough. Packed with Chesterfields, cracked leather stools, and the wood panelling of a prep school dining room, The Gowlett looks classically English, but close your eyes for a second and the aromas are such that you could be at an Italian festa in mid July. Some of that is because of the acclaimed meat-smoking enterprise that the boys are running downstairs, but a lot of the credit must fall to the authentic pizza oven out back. Expect wafer-thin, yet robust bases topped with punchy ingredients and a thoroughly good time. 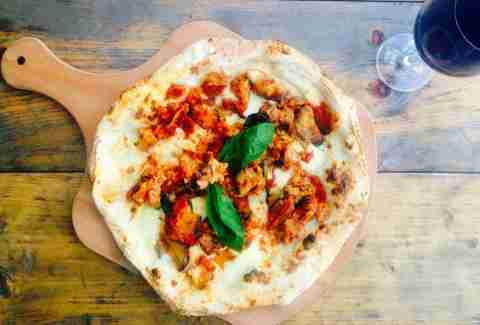 Franco Manca is the gold star, the golden goose, and the Goldman Sachs of London’s pizzerias. It’s the chairman, the CEO, and the president of London Pizza PLC. In short, it’s number one. Sure, the toppings are wonderful in their simplicity -- yogurty Buffalo mozzarella, piquant cured chorizo, roasted old spot ham -- but the real star here is the base. Left to rise for 20 hours, spun on the palms of olive-skinned pizzaioli, and then blast-cooked for 40 seconds at 500 degrees C, the sourdough here holds a fresh, natural aroma and emerges from the Tufae brick oven with a smoke-speckled underside. Needless to say, at Franco Manca, it is sacrilege to leave your crusts. 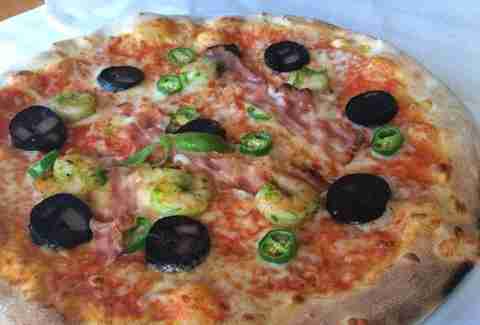 Despite sounding like the hastily abandoned perfume concept of a Spanish dictator, Delicious by Franco has justly earned a place in London’s pizza royalty. The founding family hails from Caorle, a fishermen’s village near Venice, and it cares about pizzas in a way that you or I will probably never care about anything. Farmhouse ingredients, chequered tablecloths ,and robust humour make this little bacaro a firm North London favourite, to say nothing of its wood-fired creations. Go for the delicate Emiliana with its prosciutto crudo, rocket, and Parmesan flakes to understand what all the fuss is about. Pulled pork. Black pudding. Rainbow slaw. 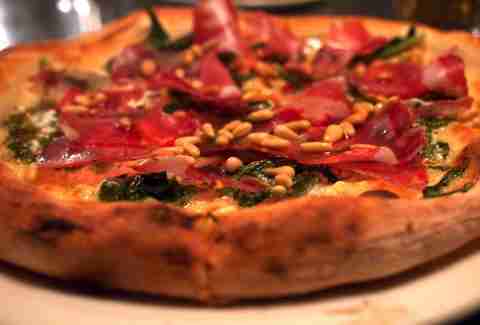 The brains behind Rocket would be shot at dawn if the Neapolitan mafia got wind of their bold and curious pizza toppings. But it’s a risk they’re willing to take. 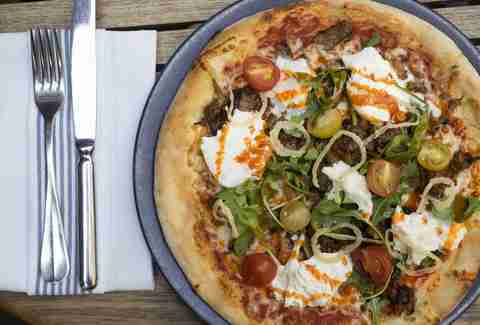 The red-blooded city boys who flock here ignore the rest of the menu in favour of the lauded pizzas, baked on Italian dough and decked out with a carnivore’s checklist of toppings. Go for the chaotic, but enchanting fusion of chorizo, halloumi, and king prawns and pray to Mother Mary that you don’t get whacked on the way out.